A strong heart is critical to overall health. But, it’s also super-critical to your sexual health. 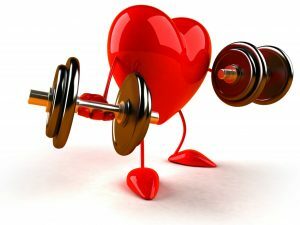 A healthy cardiovascular system means you’ll have the hardest erections possible, with the most athletic stamina to use them. (No tiring out mid-coitus!) So, let’s look at how you can build a stronger heart! American Heart Month, which helps raise awareness for cardiovascular health throughout February, is now in our rearview mirror, but better heart health should always be on the road ahead. Chances are you or someone you know is dealing with poor cardiovascular health as only one out of every three adults with high LDL cholesterol has the condition under control, according to the CDC. But American Heart Month and heart health awareness aren’t about frightening statistics. Quite the opposite, actually! We have an opportunity to think more about overall heart health and help ourselves and the ones we care about live healthier, happier lives. Making sure you get essential nutrients like fiber and burning fat (especially visceral fat) can already support a strong heart. 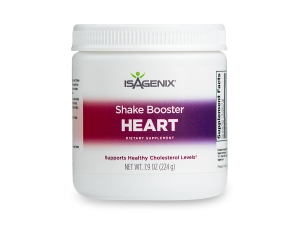 Heart Shake Booster is another tool that targets heart health by helping fight high cholesterol. * This, along with a heart-healthy diet and regular exercise, is just another powerful tool in the Isagenix product line to help reduce risk of heart disease. Control your portions: The 30-Day Isagenix System recommends a 400- to 600-calorie meal when you’re not enjoying an IsaLean™ Shake (with Heart Shake Booster, of course!). But what does a 400- to 600-calorie meal look like? Here are a few ideas to keep those portions under control with delicious, nourishing food. Eat more produce: That means more fresh fruits and more fresh vegetables. They’re loaded with nutrients and fiber and great for snacking! If you’re looking for additional phytonutrients to complement the fruits and vegetables in your diet, you can always add a scoop of Isagenix Greens™ or Isagenix Fruits to your IsaLean Shake. Choose whole grains: Whole-wheat bread, whole-wheat pasta…You get the idea. The next time you’re offered “white or brown” as a rice choice, go with the latter. Reduce unhealthy fat: Hydrogenated oils and other processed fats need to go! Good fats found in avocados, olive oil, or the omega-3 fish oil tablets found in Complete Essentials™ Daily Packs are a better alternative to the trans fats found in other junk. Eat lean protein: Chicken breast, turkey, and fish are all great examples of lean protein – you probably noticed how much they’re used in the recipes above. But vegetarians can also get their lean protein from IsaLean Shake Dairy-Free, which uses high-quality pea and brown rice protein. Lower sodium intake: Who doesn’t love a salty, savory snack? A little is OK, but a lot can be problematic. Learn ways on how you can reduce your sodium intake here – Tired of Getting Up to Pee at Night? Try This! Plan ahead: If you fail to plan, you plan to fail. Many people fail on their diet simply because they didn’t plan ahead, plan ahead and set yourself up for success. Occasional treats are OK: A healthy diet is sometimes difficult, and we need the occasional treat to help keep us on course! Be sure these treats are small and only every once in awhile. There’s no such thing as a magic pill or a magic powder. Heart Shake Booster is a fantastic tool to help combat high cholesterol and help reduce the risk of heart disease,* but it’s just one part of a healthy lifestyle to help build a strong heart. A heart-healthy diet and lots of good exercise are essential to a happy, healthy lifestyle. So, boost your shake, boost your diet, and boost your workout routine! American Heart Month is behind, but a better life is just ahead. *Foods and supplements containing at least 0.65 g per serving of plant sterol esters, eaten twice a day with meals for a daily total intake of at least 1.3 g, as part of a diet low in saturated fat and cholesterol, may reduce the risk of heart disease. A serving of Heart Shake Booster supplies 0.65 grams of plant sterol esters. Previous articleTired of Getting Up to Pee at Night? Try This!